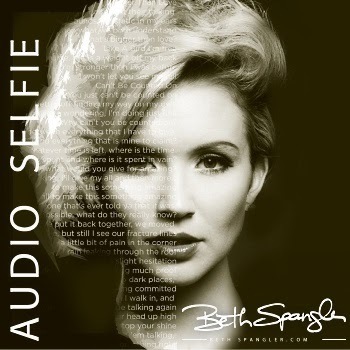 Today we're spending Seven Questions In Heaven with Beth Spangler! I love writing and performing music that moves people both emotionally and physically. I am a dancer, so while I love a good power ballad, I also dig a good, catchy beat that I can move to (You will find a combination of both on my new EP Audio Selfie). Four words I would use to describe my music would be soulful, relatable, fun, and inspirational. I grew up living and breathing Whitney Houston and Mariah Carey. They are definitely my greatest musical influences. Other very influential artists throughout my life would include Ray Charles, Etta James, Michael Jackson, Brian McKnight, and Christina Aguilera. Hmmm... I guess the strangest to date would have to be my performing a two hour set on a farm trailer in someone's backyard. People were literally riding up on horses. Oh, and this kid was riding a dog around at one point. I felt bad for the dog. Lol. I'm from the South, what do you expect?!? Macaroni & Cheese. I will never get enough of it in this lifetime! Music is my platform for making a difference in the world. I think it is important for people to support the artistry by buying music so that more good music can be made. I'd have to do my final jam with Whitney Houston, Michael Jackson, Justin Timberlake, Jessie J, and Ray Charles and we'd close the show with "Black Or White" by Michael Jackson.